So I get home.. and today I called him in the morning.. lucky the phone is answered.. and we went to the workshop that he appointed.. and the workshop owner quoted the Uncle RM300 cheapest to repair back the car for me... lucky i did not accept this RM150.. if not i will need to pay myself.. anyway.. I can get back my poor car on Tuesday.. hopefully everything is fine!!!! Good luck to me!!! 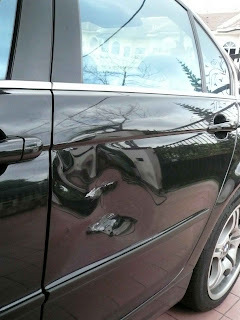 When I saw the dent I also feel sorry for the car (& of course you too la). Honestly I think he cannot refuse to give his IC in an accident. If he refuses then should go to police station together to make report and say you wanna claim from his insurance company. He'll have to give his IC then. If can trust then ok la, if not then must get IC. Check paint job when you get your car back. make sure tone is identical to other surrounding parts of the car.